Baked oatmeal is one of my favorite weekday breakfasts. I can reheat leftovers at work and if I’m feeling fancy, drizzle some warm milk over the top. Ever since September rolled around, I’ve been craving baked oatmeal and baked pumpkin doughnuts. At least I have one crossed off my must-make list! 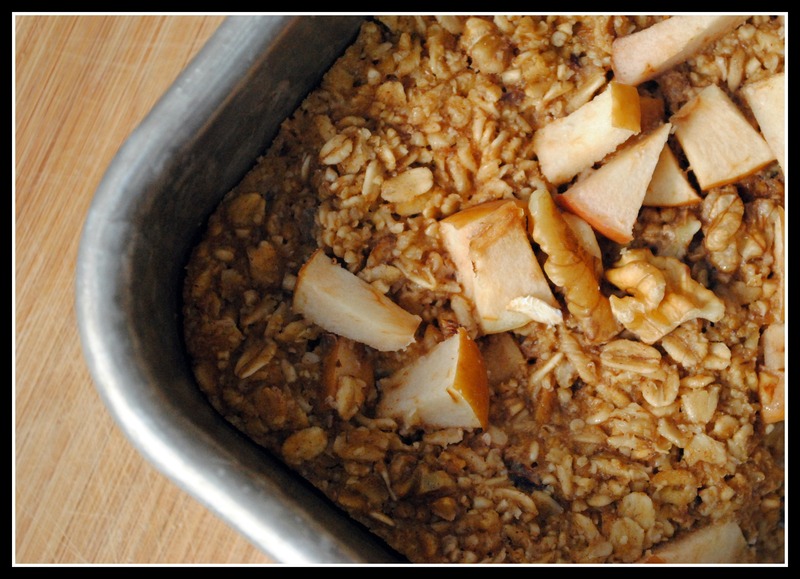 This particular baked oatmeal recipe couldn’t better represent fall. Between the pumpkin, cranberries, and apple…it’s a breakfast fall delight in every bite. For added nutrition, the recipe calls for wheat germ and walnuts which are both good sources of omega 3 fatty acids while the wheat germ also adds additional fiber to make for a very filling start to the day. Preheat the oven to 375 F. Spray an 8 x 8-inch baking dish with cooking spray and set aside. In a large mixing bowl, combine the oats, wheat germ, brown sugar, cinnamon, salt, baking powder, and cranberries. In a separate bowl, combine the soy milk, pumpkin puree, melted butter, egg, and vanilla, whisking until the mixture is smooth. Pour the wet mixture into the dry mixture, and stir to combine all of the ingredients. Add the apple and combine with the wet oatmeal mixture. Spread the oatmeal into the baking dish, and sprinkle with walnuts. Bake for about 20 minutes, until the oatmeal has set and the top is golden. Serve warm, topped with additional soy milk, if desired. Yield: 5 servings. Result: I threw this oatmeal together in about 15 minutes one morning and it baked while I got ready for work. Any recipe I can make on a weekday morning isn’t too labor intensive or timely. I love that between the apple and cranberries there is about a half serving of fruit, and the walnuts, milk, and egg add protein. Delicious…enjoy! Short post today…busy day ahead! You talking about these breakfast burritos is making me crave them!! How’s the job market in Cleveland? Fingers crossed for you! I made this recipe a couple of days ago and have been eating it for breakfast. It’s AWESOME! I throw a little half and half on top before I nuke it. My recipe was the same but called for pecans. And I didn’t have wheat germ so I just replaced it with more oats. If I had flax seed that would have gone in. I think my next batch might involve some additional spice…maybe pumpkin pie spice! Wow, I’m so loving that this is packed with fall flavors but is so nutritious. And easy! Seems like something I could make on Sunday then enjoy throughout the week with a quick reheat in the microwave. Win! Yes! Reheats perfectly! Especially with a splash of milk! I haven’t made baked oatmeal in such a long time – thanks for the reminder. I love it because make it once and you have a few breakfasts already made for the week! I had oatmeal too…but just regular ol’ bowl of oats! This baked version looks tasty! I’m a big fan of oatmeal for breakfast. With pumpkin so readily available right now, it’s the perfect time to make this oatmeal. I’ve linked your recipe on my Healthy Cooks Club page. Delicious! This recipe just sounds like fall. I love it. I often feel like breakfast is where I lack creativity. 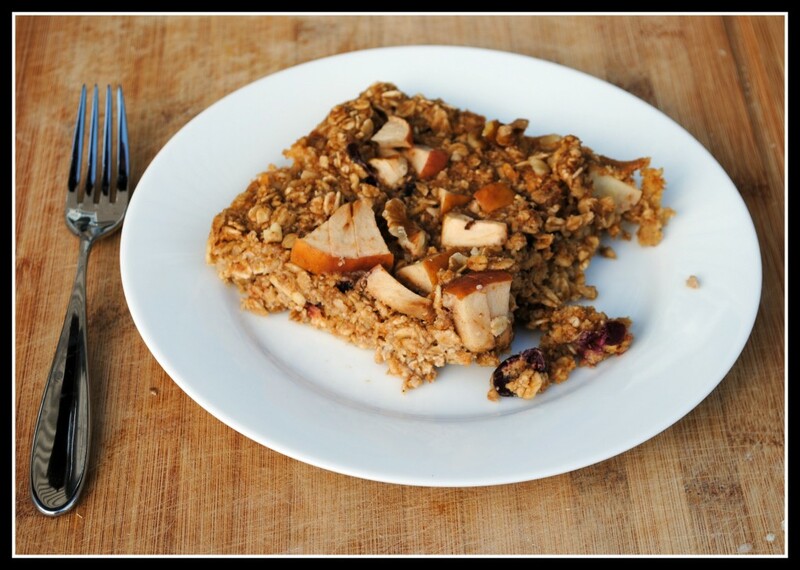 This baked oatmeal looks amazing.I did a baked oatmeal the other day and it was just delicious! Perfect for the colder weather. I have made this and LOVED it! And I am NOT a big oatmeal fan! Definitely a keeper! This has been quite the popular recipe and lots of people it seems have enjoyed it! I must be one of the last…but better late than never! And, there will be an “again!” YUM! Yum! Pumpkin and apple sounds delicious! As for breakfast this morning, it’s whatever the school is having-I eat with my kids everyday! You have stolen my heart with this one, Nicole! It’s everything I love about fall all wrapped up into one delicious meal! Geesh Nicole, I need to get on this pumpkin train of yours! You are unstoppable with these pumpkin recipes! Mmmmm, this sounds perfect. Sounds like a great way to start my day! For breakfast, I had honey bunches of oats cereal with almond milk, glass of oj, and coffee. I wonder if this could be made in the microwave.. hmm.. I might have some experimenting to do 😉 What a great flavor combination! Oh my deliciousness!!! I just made this for breakfast tomorrow and our apartment smells AMAZING!! I can’t wait to actually taste it! 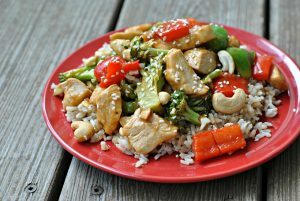 I just have to tell you…this recipe was absolutely DELICIOUS! It was a huge hit in our family. The only change I made was using fresh cranberries rather than dried. Thank you for sharing! Hey! GREAT question! I think it would work. I actually ran out of old fashioned oats and had to sub in about 1/2 cup of the steel cut. I couldn’t notice a difference at all. What I may do if I were you, is make the dish the night before and let it soak overnight in the fridge and then bake in the AM. Since the cooking time isn’t too long, you want to be sure those steel cut oats have enough softening power! If you try it, let me know…! I meant to say “I wonder if I could use steel cut oats in your recipe.” Not “them.” WOOPS! I took this basic recipe and made some minor modifications and came up with an amazing breakfast option! I am on WW and like to eat about 8 P+ for breakfast, and I was able to make this fit…so thanks for posting the recipe! I ate a ton of steel cut oats last fall and winter for breakfast and have kind of burnt out on them, so this is a welcomed alternative, and it is good for breakfast both at work and at home. I would love to hear what changes you made! 🙂 I want to make it again…maybe with a bit less carb! I went with what I had, so I replaced the wheat germ with wheat bran. 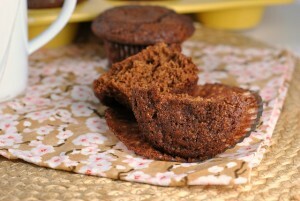 I also used light brown sugar, which is what I had on hand. I added 8 T of chia seeds (one per serving), and I also used dried cherries instead of cranberries. I left out the apples and nuts. I have been slicing up a banana and mixing it in with it every day, which bulks it up and adds some nice flavor. Next time, I am thinking of skipping the dried fruit altogether and maybe adding some honey in.